This week, Apple chose Scanner Pro as its App of the Week. Normally $6.99, the app will remain free in the App Store until Tuesday, Jan. 7th. Just finished writing up the details along with a screenshot tour. Enjoy! 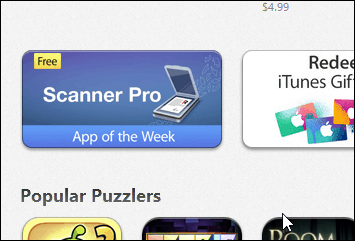 This week, Apple chose Scanner Pro as its App of the Week. Normally $6.99, the app will remain free in the App Store until Tuesday, Jan. 7th. Click here to download it from the Apple Store. Email or print scanned documents (I used the email feature below. Very slick). Upload scans to online storage including Dropbox, Evernote, Google Drive or iCloud which syncs across all your iDevices. Today I downloaded and tested out the scanning and email features on a receipt I always seem to lose track of right before tax season… Looks like I might have found my new favorite app thanks to Apple. Here’s a few screenshots which should give you a good idea of how it works. Start by finding something you need to scan. 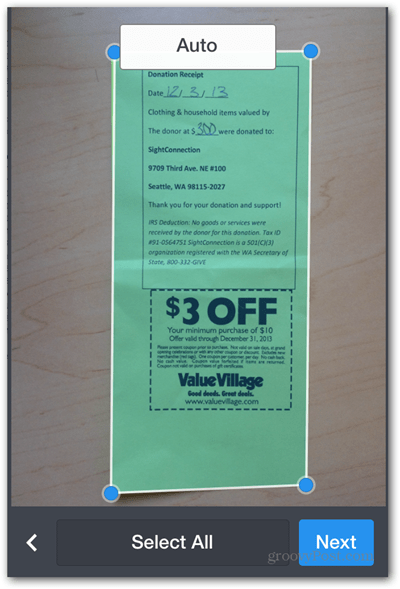 I’m going to scan a Receipt from a recent donation at a local charity. 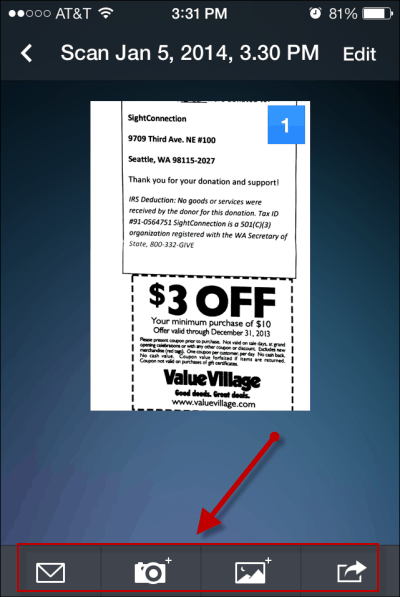 The app automatically detected the edges of the document I was scanning which was very groovy. Once you capture the image, you can leave it as-is or change it to black and white or gray-scale. Once you have the scan you can Email it, save it to your Camera Roll, Upload it to Dropbox or another service and even Fax it. 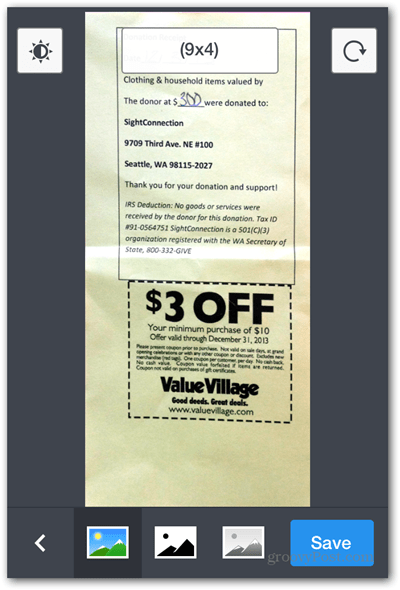 Note: When I tried to fax the image to my home fax in Seattle, the charge was $0.99. So that part of the app is not free. In my testing I emailed the scan to myself and it arrived within seconds with perfect clarity. Overall, I’m very happy with the simplicity and cost… of this new app and how it will impact how I scan and store receipts and documents. Granted, the overall system isn’t as automated as a professional solution from Neat Receipts however, Scanner Pro is free (at least until Tuesday) and everyone has a mobile… which makes this a very valid alternative. Quick Update — After taking a few scans with the app, it began to crash repeatedly on my iPhone 4S. After I reboot the phone however it stabilized. Hopefully it remains stable for everyone else. Is there a similar app for Android that you recommend? Steve – the little scanning app is awesome. Files are quite large, though. Any ideas on reducing file size of multi-page scans? Anyway — let me see if there’s a way to turn down the quality of the scans. That’s my only guess to reduce the size of the files.